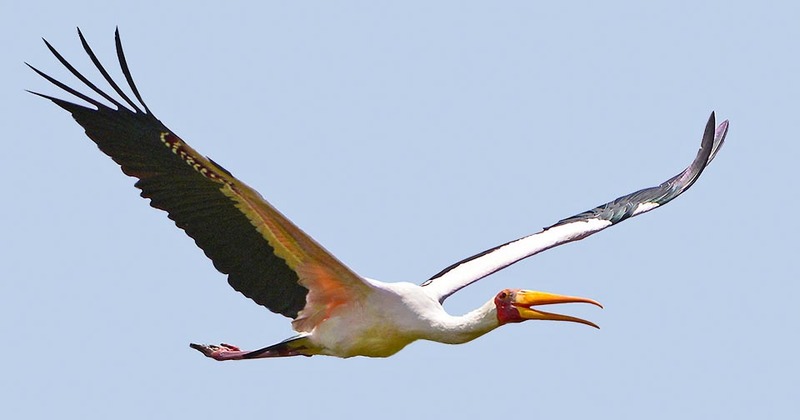 The quaint Wood ibis or Yellow-billed stork (Mycteria ibis Linnaeus, 1766) belongs to the order of the Ciconiiformes and to the family of the Ciconiidae and is one of the most diffused and most coloured storks of the African continent. So nicely coloured that its Asian counterpart, so much similar to be easily mistaken if it had the same range, is commonly called “painted stork”. It is sufficient a small body of shallow water, a flooded plain, a muddy bank of a river or of an open swamp and we can see immediately appearing this unique bird that with its big and yellow bill half immersed in the water walks slowly while hunting. Funnier and more characteristic is the rest position it assumes when stays perched on the soil, absolutely still under the beating sun of the African tropics, sitting on the knees in a strange and unnatural position. Rarely we can see birds in such positions and seen the morphological characteristics and the considerable size of this stork at first. sight we have the feeling that it has the legs broken and that it has taken this position just to stand up. Another characteristic of this bird that it evidences when still young in the nest, is the unbelievable greediness it shows at the moment it gets the food so much to deserve the German nickname of Nimmersatt = insatiable, practically a bottomless pit that swallows continuously all what is offered. Consequence of this greediness is an incredible increase of its weight that in only twelve days goes from 50 g to almost 1 kg. 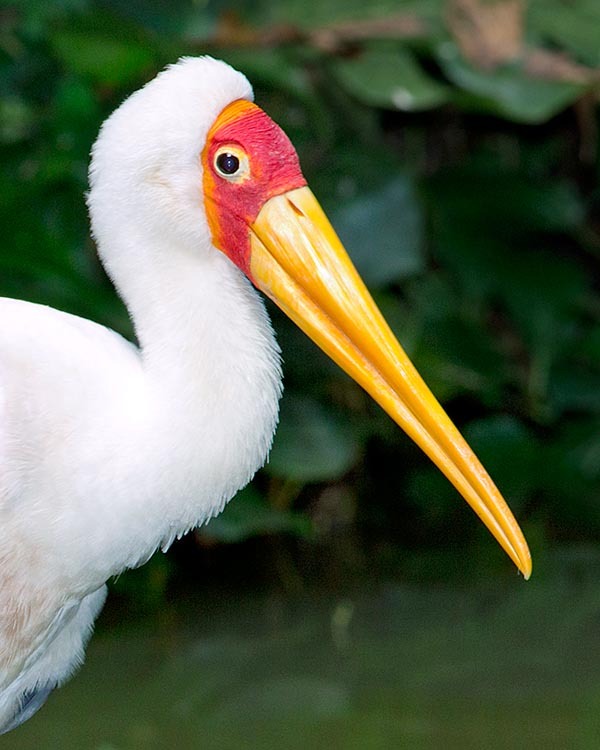 The etymology of the generic name Mycteria comes from the Greek mukterizo = nose, to pull the nose upturned, rightly due to the big bill it has, and the specific one ibis is the name of a bird identified in the old Greece as the Egyptian sacred ibis, even if presumably it refers to another bird. In several European countries, Italian included, is employed the name of Tantalus, a reference to the old figure of the Greek mythology sentenced to the eternal torment as having robbed the gods of Olympus of the nectar and the ambrosia of which they fed. A reference that has led also to the creation of a neologism often used in the Anglo-Saxon world, to tantalize, rightly to indicate the slow and continuous torment of a person. 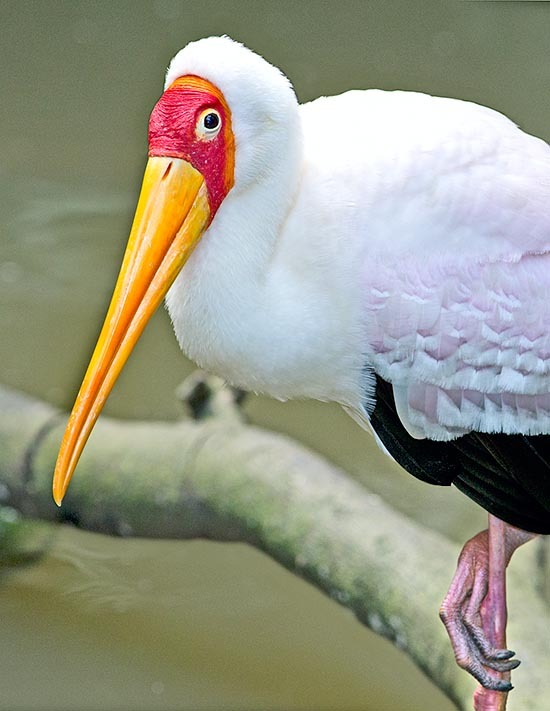 Other vulgar names: in English, yellow-billed stork; in German, Nimmersatt; in Spanish, Tántalo Africano, in French, Tantale ibis; in Portuguese, Cegonha-de-bico-amarelo and in Japanese, afurikatokikou. 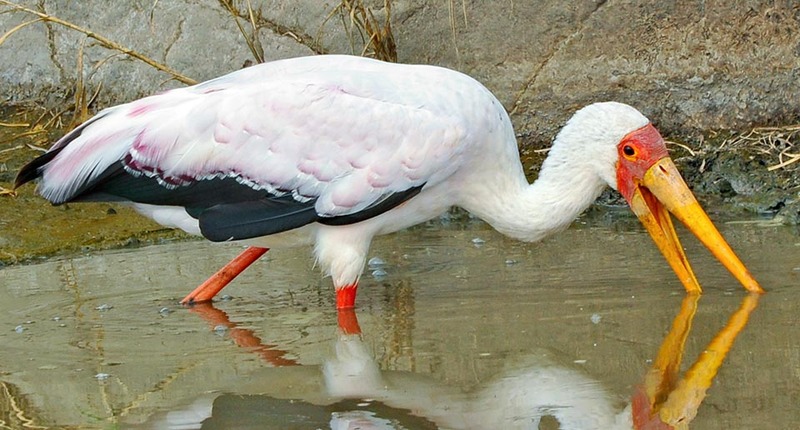 The yellow-billed stork is practically present in all Africa south of desert of Sahara and also in Madagascar. It tends to be more diffused in the eastern part of the continent with strong concentration in some areas of Ethiopia, of Kenya and of Tanzania, it does not fail to occupy all humid and swampy areas present in the other part of the continent, avoiding systematically dense forests and pre-desert zones. 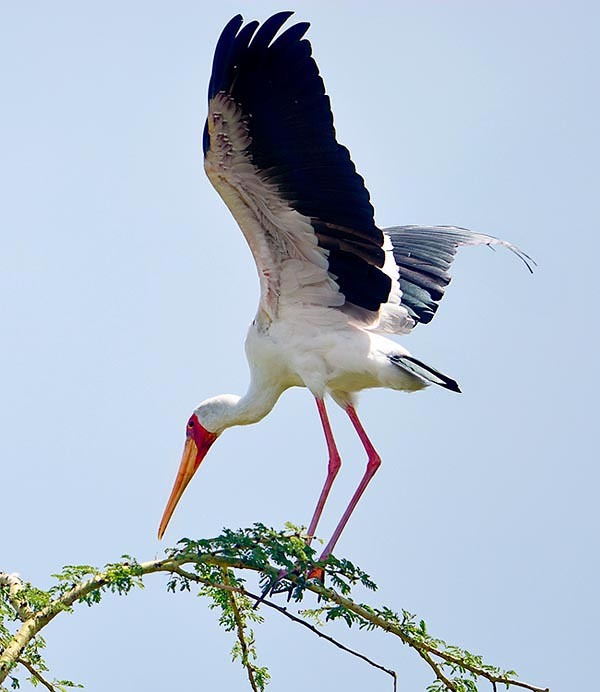 Outside of the African continent do live species rather similar to the Yellow-billed stork. All three of these species are considered as belonging to the same genus and differ only for minor details at times not easily distinguishable on the field. However, they occupy well defined regions with partial overlappings of the territory in particular in Asia. The Wood stork (Mycteria americana) of the America continent, the Milky stork (Mycteria cinerea) of the Indochina Peninsula and Indonesia and the Painted stork (Mycteria leucocephala) of the Indian subcontinent up to south-eastern Asia. The need to have available humid areas with particular characteristics, obliges this stork, usually resident, to perform movements inside of the continent following the cycle of the seasonal rains, and so its presence becomes ubiquitous depending on the different seasons. This necessity of nomadism is determined by the drought periods that cause the drying up of the frequented humid areas as well as when occure floodings that modify the level of the waters, usually, shallow, where this stork goes hunting. Depths greater than the length of their legs would render impossible to this bird to practice its model of hunting thus rendering the swamps impracticable in the same way of a drying up. Conversely, where the marshes are perpetual, this stork becomes permanently resident and the territory remains occupied during the nidification period as well as later on. The yellow-billed stork is a medium-sized stork with a wingspan of at least 150 cm, a weight of 2 kg and a length of 100 cm. The body is totally white with the black tail and remiges that stand out during the flight that consists in fast beats of the wings spaced by glides with wide-open wings and drawn neck. The bill is very particular as it is conical and very robust, with the tip slightly curved, more than 30 cm long and of a nice intense yellow colour. The front, the face and part of the head are bare and of bright red colour with black eyes. The sexes are similar even if the female has a slightly massive bill and a weight lower than the male. Although it remains coloured in any period of the year, the yellow-billed stork shows a livery with more lively and brighter colours during the nidification period. In fact, in this particular moment the legs and the white of the plumage assume a pale pink nuance and the red of the face becomes even vermilion. The livery of the young has no colour and is totally greyish with the face slightly orange and greyish yellow bill. After about one year the plumage begins to get coloured gradually reaching in a few more months the livery of the parents. It is not a very talkative bird and usually does not emit particular sound or calls but real crackles while nourishing the chicks or due to quarrels happening on the overcrowded trees where the colony lives and during the courting. Typical inhabitants of swamps and lakes to which is strictly linked for feeding reasons, this stork has a quite particular way of fishing its preys. Walking slowly in the water, plunges its massive bill almost totally keeping it slightly ajar and moving it rapidly in a zig zag till when, hit a small animal or a fish, closes it snapping thus entrapping irredeemably the prey. Incredible are the quick reflexes in closing the bill and entrapping the prey. We talk of some milliseconds whereby very hardly the small animal succeeds in escaping. The victim is immediately gulped down whole and still alive with a quick raising of the head and a similarly fast flying seizing to then immediately resume the previous rhythm of fishing. When various of them are working back to back, the marsh is practically sifted thoroughly even if, of course, not all the inhabitants are seized. 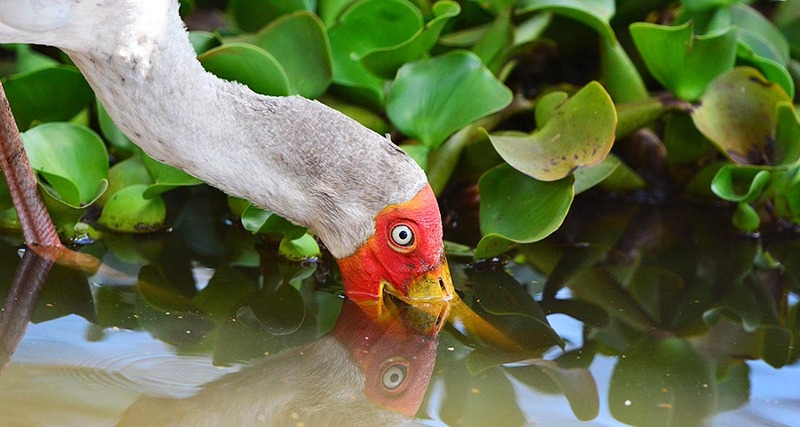 Its feeding mainly consists in small fishes, amphibians, worms, crustaceans but also in small animals and even young birds. The yellow-billed stork usually awaits the end of the rain season for beginning the nidification. As a matter of fact, after this period the level of the waters that had invaded every corner of the territory begins to decrease, taking it to the ideal measure for the foraging. However, it is not rare to see nidifications in every season provided that the area is furnished of an environment guaranteeing the supply of the daily necessities. After having chosen the tree where to nidify, the male patiently waits for the arrival of a female, spreading the wings and stretching continuously the remiges or moving as if it were shaking off some dust. 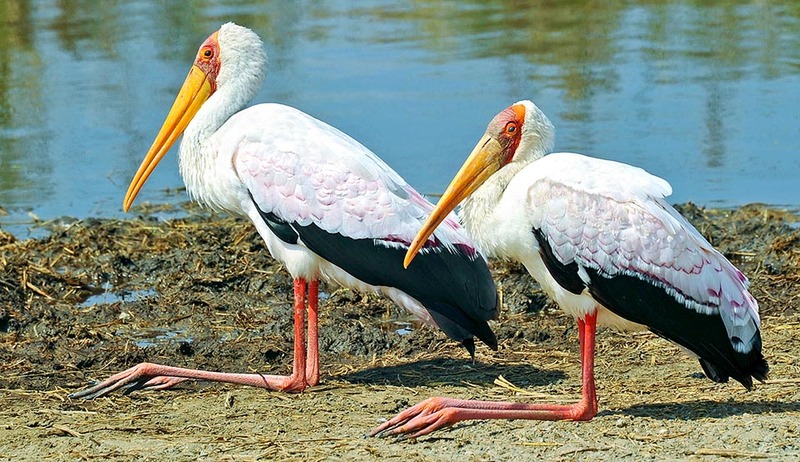 The yellow-billed stork has many other behaviours for courting the female. During this show it emits slight blows and small sounds that accompany the courting. The nest is a fairly coarse platform, built by both partners on the branches of the crown of the tree in community with similars or even other ardeids. 2-4 whitish eggs are laid and both sexes take care of the hatching for about 30 days. The eggs are laid in alternate days therefore the birth of the chicks is asynchronous and this causes the presence in the same nest of nestlings at times with various days of age. It is natural that in case of a sudden shortage of food, in a nest where the young are extremely greedy and voracious, the last born die naturally, leaving the field open to the older siblings. The food carried to the nest is regurgitated at the feet of the chicks in way that they learn quickly to nourish by themselves. As usual in the ciconiiforms, often the parents carry water in the bill reversing it directly into the throat of the chicks to quench their thirst. Another characteristic of these species in order to fight the strong heat suffered in a nest exposed all day in the sun of the tropics, is that of urinating on the legs to refresh them. It is not rare in fact to see ciconiids having very white legs rightly due to this habit. The young leave their nest after 8 weeks but remain with their parents for some more time even if already able in fishing, till when they reach the independence. The maturity is reached by the third year of age. In some African areas these storks are hunted and often their meat is sold in the rural markets. Because remaining in the nest for long time despite having reached the size of the adults, this species becomes often object of illegal catching for the local feeding. 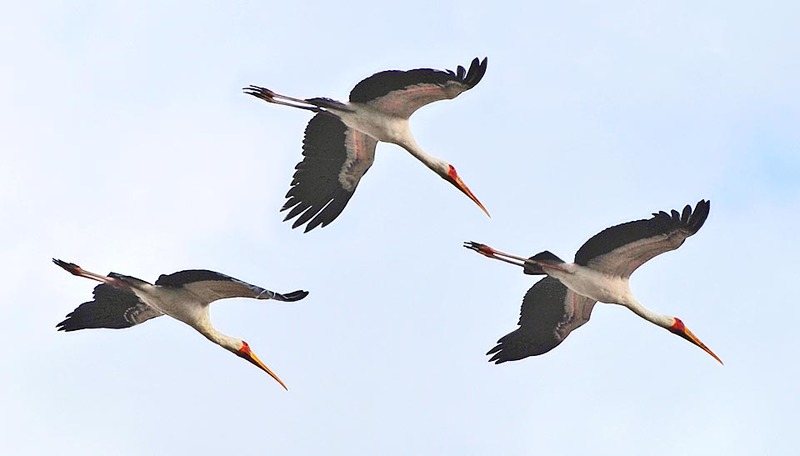 The yellow-billed stork does not have many natural foes but the usual eagles or the big night raptors, therefore, considered the good number of presences and the quite vast territory occupied, it is not listed among the endangered species.